Prominent French publication 01net carried word of Google's supposed plan on Tuesday, suggesting that iOS support options could be announced at Google's I/O developer conference in May. Google's ramp schedule might be pushed up if initial Apple Watch sales are high enough to pose a threat to the existing Android Wear ecosystem, the report said. Google could not be reached for comment on the claims. Support for Apple's mobile OS could potentially give the Internet search giant an advantage in an already crowded wearables space, since the Apple Watch compatibility is limited to iOS devices. Even if people prefer the features of Apple's product, some may choose to go with an Android smartwatch simply to have the option of switching between platforms. In addition to being flexible, Android Wear hardware has also proved to be much cheaper than Apple's upcoming offering. Whereas an Android product typically costs between $199 and $300, the least expensive Apple Watch will start at $349. In a report to investors earlier this week, investment firm Piper Jaffray said it expects mid-tier Apple Watch models to sell for between $499 and $549, while gold Apple Watch Edition versions could go for as much as $7,500. 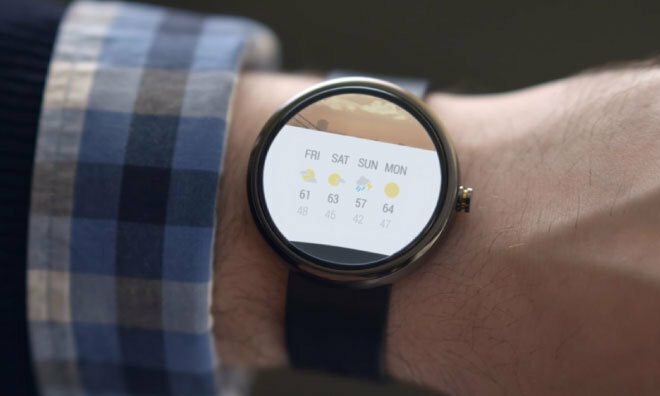 Porting Android Wear to iOS wouldn't be an unprecedented move for Google, which has frequently brought technologies to Apple's platform through app development. Support for Glass, Google Now, Chromecast and Google Maps, among others. Apple, conversely, has never developed an Android app; the only Apple Android title is Beats Music, something it picked up by acquiring Beats last year in a deal worth $3 billion. As for Apple's wearable device ambitions, the company is expected to reveal final Apple Watch details at press event on March 9, including prices and an exact launch date. AppleInsider will be providing live coverage of Apple's announcements from Yerba Buena Center in San Francisco starting at 10 a.m. Pacific.